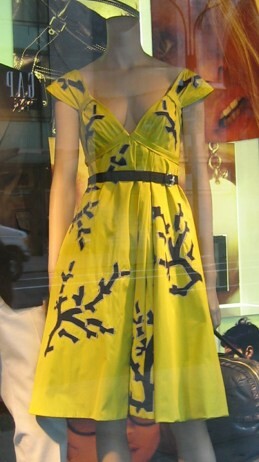 This was in the window at Bergdorf’s. Gorgeous, no? That neckline would not work well for me, but still. It’s pretty to look at. The pictures yesterday were of my friend Howard. He needs an author photograph for his next book and so I took a bunch in Washington Square Park. Thank you you for voting! (My favorite is 48.) Now that everyone has seen them, I’ll probably take them down later today. I’m going to the ballet this afternoon! I got tickets for that free dress rehearsal I posted about earlier. Can’t wait. Never go to the ballet, so something new! Should be good. And pretty to look at. – I wonder who picks the songs for Friday Night Lights. I love every song they chose. – Why does it seem like everywhere else in the country gets snow but us in New York City? Come on country. Share. – I can’t wait until American Idol gets past the auditions and to the real competition, starting in Hollywood. Love the kindler, gentler Simon. He still tells the truth, but is not so cruel about it. What can I say? I’m a wuss. – Have you all see Cloverfield yet? Because you should. – I’m hoping I get to go to the FBI’s Quantico to do an interview. I’ll be more than happy to donate a heaping helping of snow. We’ve got more than our share and then some. Yeah, I can see how you might get to the point of “enough already” but we haven’t had any that stuck this year yet. Not one good snowfall. I mean, come on.